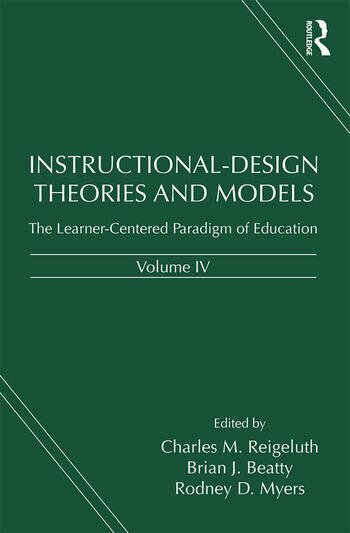 Instructional-Design Theories and Models, Volume IV provides a research-based description of the current state of instructional theory for the learner-centered paradigm of education, as well as a clear indication of how different theories and models interrelate. Significant changes have occurred in learning and instructional theory since the publication of Volume III, including advances in brain-based learning, learning sciences, information technologies, internet-based communication, a concern for customizing the student experience to maximize effectiveness, and scaling instructional environments to maximize efficiency. In order to complement the themes of Volume I (commonality and complementarity among theories of instruction), Volume II (diversity of theories) and Volume III (building a common knowledge base), the theme of Volume IV is shifting the paradigm of instruction from teacher-centered to learner-centered and integrating design theories of instruction, assessment, and curriculum. Chapters in Volume IV are collected into three primary sections: a comprehensive view of the learner-centered paradigm of education and training, elaborations on parts of that view for a variety of K-12 and higher education settings, and theories that address ways to move toward the learner-centered paradigm within the teacher-centered paradigm. Instructional-Design Theories and Models, Volume IV is an essential book for anyone interested in exploring more powerful ways of fostering human learning and development and thinking creatively about ways to best meet the needs of learners in all kinds of learning contexts. Charles M. Reigeluth is a speaker/consultant for paradigm change in education and Professor Emeritus in the Instructional Systems Technology Department at Indiana University, USA. Brian J. Beatty is Associate Vice President for Academic Affairs Operations and former Chair and Associate Professor in the Instructional Technologies Department at San Francisco State University, USA. Rodney D. Myers is an independent scholar and consultant who teaches courses in instructional design and technology and is Adjunct Lecturer in the Instructional Systems Technology Department at Indiana University, USA.